Here, beloved healing author Louise Hay offers a simple but powerful three-week program to help readers learn to love themselves and live a joyous, fulfilling life. Since 1984, Louise Hay’s You Can Heal Your Life has sold over 40 million copies worldwide. Now, in MIRROR WORK: 21 DAYS TO HEAL YOUR LIFE, Louise offers the first book dedicated to her signature practice for personal transformation. The Mirror Principle, one of Louise's core teachings, holds that our experience of life mirrors our relationship with ourselves; unless we see ourselves as loveable, the world can be a dark and lonely place. Mirror work—looking at oneself in a mirror and repeating positive affirmations—is Louise’s powerful method for learning to love oneself and experience the world as a safe and loving place. Each of the 21 days is organized around a theme, such as monitoring self-talk, overcoming fear, releasing anger, healing relationships, forgiving self and others, receiving prosperity, and living stress-free. Cultivate love and compassion in their relationships with self and others. In just three weeks, the reader can firmly establish the practice of Mirror Work as an ongoing vehicle for positive growth and self-care. Doing mirror work is one of the most loving gifts you can give yourself. It takes only a second to say, “Hi, kid,” or “Looking good,” or “Isn’t this fun?” It’s so important to give yourself little positive messages throughout the day. The more you use mirrors for complimenting yourself, approving of yourself, and supporting yourself during difficult times, the deeper and more enjoyable your relationship with yourself will become. International best-selling author Louise Hay offers a simple but powerful three-week program to help readers learn to love themselves and live a joyous, fulfilling life. Since its publication in 1984, Louise Hay's international bestseller You Can Heal Your Life has sold over 40 million copies worldwide. Now, in MIRROR WORK: 21 DAYS TO HEAL YOUR LIFE, the popular teacher and author offers the first book dedicated to her signature practice for personal transformation. The Mirror Principle, one of Louise's core teachings, holds that our experience of life mirrors our relationship with ourselves; unless we see ourselves as loveable, the world can be a dark and lonely place. Mirror work-looking at oneself in a mirror and repeating positive affirmations-is Louise's powerful method for learning to love oneself and experience the world as a safe and loving place. Like her successful video course, Loving Yourself, MIRROR WORK lays out a 21-day program of teachings and exercises to help readers deepen their relationship with themselves and live a joyous and fulfilling life. 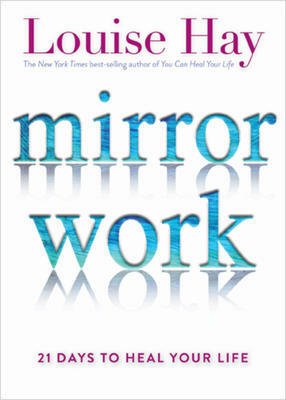 Doing mirror work," Louise tells readers, "is one of the most loving gifts you can give yourself." Each of the 21 days is organized around a theme, such as monitoring self-talk, overcoming fear, releasing anger, healing relationships, forgiving self and others, receiving prosperity, and living stress-free. The daily program involves an exercise in front of the mirror, affirmations, journaling, an inspiring Heart Thought to ponder, and a guided meditation. Packed with practical guidance and support, presented in Louise's warmly personal words, MIRROR WORK -or Mirror Play, as she likes to call it-is designed to help readers: * Learn a deeper level of self-care * Gain confidence in their own inner guidance system * Develop awareness of their soul gifts * Overcome resistance to change * Boost self-esteem * Cultivate love and compassion in their relationships with self and others In just three weeks, the reader can firmly establish the practice of Mirror Work as an ongoing vehicle for positive growth and self-care, and a path to a full, rich life. "